An outdoor pool private patios and perch on a golf course are highlights at the non-smoking Blue Rock Resort. This two-story non-smoking Blue Rock Resort has 45 rooms each featuring a private deck or patio plus a mini-fridge complimentary high-speed internet access cable TV coffeemaker iron and ironing board hairdryer and air conditioning. Recreation is easy without leaving the property thanks to the hotel's outdoor pool and tennis courts. To boot the resort is set on a 3000-yard 18-hole golf course. The on-site restaurant serves breakfast and lunch. Parking is free and pet-friendly rooms are available for a fee. 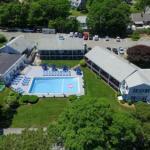 The Blue Rock Resort is in South Yarmouth four miles from the ZooQuarium. West Dennis Beach is less than 10 minutes away. New Bedford Regional Airport is 40 miles from the hotel and Logan International Airport is 77 miles.